We’d love your help. Let us know what’s wrong with this preview of The Summer Before Boys by Nora Raleigh Baskin. Julia and Eliza are best friends. Julia’s mother is serving in the National Guard in Iraq, and Julia spends all of her time trying not to think about what could happen. So the girls lose themselves in their summer, hanging out at the resort where Eliza’s father works. But when they meet a new boy, neither of them is prepared for how it impacts their friendship, and Julia h Julia and Eliza are best friends. Julia’s mother is serving in the National Guard in Iraq, and Julia spends all of her time trying not to think about what could happen. So the girls lose themselves in their summer, hanging out at the resort where Eliza’s father works. But when they meet a new boy, neither of them is prepared for how it impacts their friendship, and Julia has to cope with the possibility of being separated from yet another person she loves. Award-winner Nora Raleigh Baskin delivers a poignant look at the way a first crush can come between best friends—and the importance of not rushing to grow up. To ask other readers questions about The Summer Before Boys, please sign up. The Summer Before Boys is a pretty short and very sweet story about a normal girl, Julia, who's just beginning her early years as a teenager and whose mother is serving in the National Guard, away from home, in Iraq, a country were soldiers (and civilians too) die too easily for Julia's liking. Julia has to go live at her sister's house for the whole summer because of her parents' jobs, but she certainly won't complain. With her niece (although she calls her cousin) Eliza, she could spend hours pretending to be an Indian warrior, a medieval princess or simply a young, aristocratic lady. But things are a little bit different this time: and the novelty is spelled Michael. How will our young heroine cope with her first crush? The Summer Before Boys was a bit more juvenile than I was expecting and although I liked the main character's freshness and carelessness, I found it quite boring in some of its parts. The crush she has on Michael is an infantile one and there was no real development in their relationship. I enjoyed Julia's thoughts about war and her mom's situation a lot, I found their simpleness and strength admirable. Before reading Anything But Typical, I had little knowledge of Nora Raleigh Baskin's writing. I guess that I'd probably seen her name on a few books, but none of them had especially caught my attention until I began to hear the Newbery buzz generated by Anything But Typical. It was a book that I ended up reading mostly as an afterthought, just to "A friend is someone who knows the song in your heart, and can sing it back to you when you have forgotten the words." Before reading Anything But Typical, I had little knowledge of Nora Raleigh Baskin's writing. I guess that I'd probably seen her name on a few books, but none of them had especially caught my attention until I began to hear the Newbery buzz generated by Anything But Typical. It was a book that I ended up reading mostly as an afterthought, just to try the work of an author with whom I wasn't familiar. As it turned out, Anything But Typical clicked with me immediately; the story was heartrending and raw, so emotionally captivating that it echoes in my heart no less resoundingly now than on the day I turned the final page. 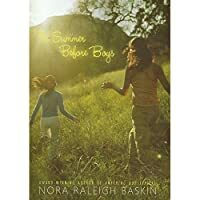 I rarely am completely convinced by an author after only one book, but such was the case here, and when I found out that Nora Raleigh Baskin had written a new novel, The Summer Before Boys, I knew that I had to make room for it on my shelf. Having now read the book, I'm pleased to be able to say that Nora Raleigh Baskin has come through with another strong, emotionally charged story, blending together two complicated halves of a plot to form a single novel that stands above most other juvenile books of 2011. Equally appealing to boys or girls, The Summer Before Boys is a wise, inspiring and very understanding story that puts into proper perspective all different kinds of pain from missing others, whether it's relational distance beginning to pry its way into a close friendship, a mother engaged in military combat overseas, or the desperate scheming of a girl trying to attract the notice of a boy she has just begun to realize that she might actually like. Julia and Eliza have an unusual sort of friendship. There's nothing especially unusual about the relationship, actually, just the particulars of how the girls are related. Julia is Eliza's aunt, born from a second marriage twenty-two years following the birth of Eliza's mother. Because of this, Julia and Eliza are both the same age, still in elementary school but graduating to junior high before long. They're moving toward adolescence, but unfortunately for the two close friends, Julia gets there first, and a wedge of disparity begins to grow between them as Julia's interests switch to thoughts of boys while Eliza still just wants to play the same imagining games that they've always played together. Unlike most books that address this topic, the reader can easily find traction to identify with either Julia or Eliza in their situation, feeling the euphoric thrill of budding romance that fills Julia's veins while also seeing through Eliza's eyes the dust being kicked up in her face as Julia speeds off and away after her own interests, seemingly no longer caring about what the two of them had cared about for their whole lives. It's a hard situation for either girl to be in, and I suspect that most of us have found ourselves on both sides of this chasm at some point in our lives. How does one deny the heady excitement of attraction, the way that the chemical and emotional surges can rock a person like a ship being tossed about by the waves, dangerous but too exhilarating to want to bring the ship in to harbor? On the other side, what does one do when a close friend suddenly starts acting peculiarly, desiring things that held no interest for them a short time earlier but now seem to be all that possesses their thoughts? How does one reconcile oneself to being left behind while a friend goes off on adventures of his or her own, dismissing you as if you were nothing but a stepping stone on the way to bigger and better things? These are the emotions with which Julia and Eliza are confronted, each facing their own set of issues, as the summer of 2004 begins to show signs of turning into autumn and the rumblings of trouble increase like the first rolling thunder of a summer storm. It's not just the problem of boys that is troubling Julia these days, though. Her mother has been in the Middle East with the U.S. military for a long while now, helping maintain peace in a political region as dynamic and unsettled as anywhere else in the world. Though Julia's mother won't be in direct combat, Julia's internet searches conducted on her many anxious, sleepless nights have shown that plenty of women have died in wars even when not involved in combat. Because when war breaks out between two sides that are both desperate to win, seeing-eye bullets have a way of flying through windows and bombs somehow tend to find occupied buildings, and there's not a single ounce of discretion in a hunk of metal designed to explode and kill on contact. Julia can't get the thought out of her mind that her mother really could die overseas, that the last time she saw her might be the last time she sees her. The worry over her mother is an ever-present backdrop to the widening rift with Eliza, as the two friends continue to grow apart when Eliza notices the apathy with which her "aunt" is treating her. It all sets the stage for one night that changes everything, a night in which past and present collide in multiple unexpected ways and the mettle of friendship and family is tested as never before. Will Julia and Eliza's character, both as individuals and as best friends, withstand the test when their situation goes from bad to worse? I'm not sure what I liked best about The Summer Before Boys. The story resonates on an emotional level, as I'm sure most readers will agree, and Nora Raleigh Baskin's writing is sweet and compelling, drawing us in ever further with each step we take as Julia and Eliza's story becomes increasingly important to us. As multi-faceted and multi-tiered as it is, The Summer Before Boys is a book that I easily could have seen receiving some sort of Newbery recognition, either an Honor citation or the coveted Medal, for the 2012 American Library Association awards season. In my opinion, Nora Raleigh Baskin has proven herself to be a writer of the first rank among her contemporaries, and I don't think it's an over-exaggeration at all to say that she's earned the right for the releases of her books to be regarded as major literary events by passionate followers of youth novels. I earnestly and enthusiastically give The Summer Before Boys my recommendation, and I hope that it becomes even more popular as readers continue to discover it. "Imagination is much more important than knowledge. For knowledge is limited to all we now know and understand, while imagination embraces the entire world, and all there ever will be to know and understand." The Summer Before Boys by Nora Raleigh Baskin is a whimsical and poignant (my overuse of this word is going to kill me but truly this is a poignant story) about two little girls on the verge of growing up and maturing, but at very different speeds. Julia and Eliza are best friends, spending the summer together. Julia's mother is serving in the National Guard and Julia spends all of her time trying not to think about what could happen. So the girls lose themselves in their summer, hangin The Summer Before Boys by Nora Raleigh Baskin is a whimsical and poignant (my overuse of this word is going to kill me but truly this is a poignant story) about two little girls on the verge of growing up and maturing, but at very different speeds. Julia and Eliza are best friends, spending the summer together. Julia's mother is serving in the National Guard and Julia spends all of her time trying not to think about what could happen. So the girls lose themselves in their summer, hanging out at the resort where Eliza's father works. But when they meet a new boy, neither one of them is prepared for what it does to their friendship. Julia and Eliza are twelve year old best friends but things are changing for Julia. Her mother is currently deployed in Iraq and Julia is staying with Eliza for the summer while her father works. It should be an ideal summer for these girls except that Julia worries constantly about her mother and then, suddenly, experiences a new kind of worry. Boy worry. The kind where you wonder if your hair looks okay, if you are "glistening" from the sun, where you carefully plan out your moves for the day in the hopes of seeing him. But Eliza is not on the same page. She is still in a world of make-believe, where the girls become captives and have to trek around the mountains. She still yearns to play with dolls. Julia finds those desires fading as reality has touched her world in new ways. This is a coming-of-age story in that restless, uncomfortable way that can only come from turning twelve to thirteen years old. Such an awkward age group, where things do change dramatically but not at always at the same speed for close friends. I enjoyed the reality of this situation, as Julia wavers between being a child and enjoying her imagination, creating games and scenarios with Eliza, while at the same time, she longed to escape that because she wanted to pursue new desires. She did not want to lose Eliza and in fact, Julia still greatly enjoyed playing Lynette and Lester, playing dolls, but at the same time, it was obvious that she was maturing faster than Eliza. The author created a good case for this maturity by showing Julia's worries over her mother. Will her mother return from Iraq? Will she come back different, like her classmate Peter's dad? Julia has been forced to grow up sooner because of her family life. And while I was thoroughly enjoying the reflections Julia was going through, part of me wondered if a twelve-year-old reader would truly be able to identify with Julia in this way. Julia is extremely self-possessed and seemingly all too aware of the changes she is going through. I'm just not sure how authentic this will be when being read by tweens of this age. For me, I found it to be very true-to life, but that is based upon reflection on this point, on having the maturing to step back in time and examine my own feelings while growing up. Can you do that when you are actually that age, in the moment, experiencing those feelings? I'm just not sure. Nonetheless, I truly enjoyed this story. It has a childlike quality to it that matches the changes Julia is going through. She is not quite a child but not nearly a teen. At one point, she receives her first cell phone and I thought that was a great demarcation of her life before and then after, when she starts experiencing feelings for boys. These feelings cause unintentional conflict in her relationship with Eliza, unintentional slights and cruelties that build up until even Eliza cannot ignore what Julia is doing. The setting also proves to be perfect for this book. Summer, that time when everything is warm, sunny, and wonderful, but where subtle changes often take place, rendering someone new and changed by the time fall comes along. Intertwined in this story is also the stories of women serving in the military. I loved the little snippets that the author includes in the narrative. When Julia's mom is shipped overseas, she becomes somewhat more involved in what it truly means to be a woman serving in the military and that reflects very nicely in the story. Remember back when life was so much simpler? You didn't worry about whether you had bought the right brand/style/color/etc. of jeans/shoes/purse/etc. You didn't spend hours agonizing over whether your crush liked you back or even knew you existed. There was no boy drama, no friend drama, no clique drama... There really wasn't any drama at all. It was just you and your best friend, living in a wonderful, magical world of your own making. Remember when that all changed? This is how it is for Julia a Remember back when life was so much simpler? You didn't worry about whether you had bought the right brand/style/color/etc. of jeans/shoes/purse/etc. You didn't spend hours agonizing over whether your crush liked you back or even knew you existed. There was no boy drama, no friend drama, no clique drama... There really wasn't any drama at all. It was just you and your best friend, living in a wonderful, magical world of your own making. This is how it is for Julia and Eliza the summer they are both 12. With her mother serving overseas in Iraq, Julia is sent to live with her best friend Eliza at the wooded resort where Eliza's father is caretaker. As they always have in the past, the two girls play their make-believe games, becoming poineers, victorian girls, Indian captives...whatever direction their imaginations take. But this year, something is different. Julia can no longer conjure up the vivid images of the long dresses and buttoned boots she and Eliza would wear in these games. And this summer, she suddenly feels a widening gulf between her and her best friend. It's nothing Julia can put a finger on. She just knows something is different. She is different. Then Julia meets Michael, a boy her age who is also staying at the resort. Suddenly, Julia wants to get to know this boy. She does everything a girl with a first crush does: She spends hours secretly writing his name in her journal and figuring out ways she can just happen to bump into him. What bothers Julia is she can't share her feelings with Eliza because Eliza is still in full-on little girl mode. But Julia can't hide her feelings forever. The truth comes out and Julia and Eliza have a huge fight. Eventually they make up and become friends again, but things are never the same. Both girls learn an important lesson about never putting a boy or a crush before friendship. Mixed in are historical bits and pieces about women in the military. Baskin's book perfectly captures that transition from the make-believe of childhood to a growing awareness of one's self in the larger world. Julia and Eliza have been best friends for as long as they can remember, knowing each other well enough to disappear into their imaginary worlds in an instant. But the real world has become a lot harder to ignore since Julia's mom was deployed to Iraq. Now they have the whole summer to spend together, but Julia is finding it more and more difficult to lose Baskin's book perfectly captures that transition from the make-believe of childhood to a growing awareness of one's self in the larger world. Julia and Eliza have been best friends for as long as they can remember, knowing each other well enough to disappear into their imaginary worlds in an instant. But the real world has become a lot harder to ignore since Julia's mom was deployed to Iraq. Now they have the whole summer to spend together, but Julia is finding it more and more difficult to lose herself in their games, especially with her sudden interest in a certain boy. I loved the way that Julia and Eliza's imaginary play was described, as if Julia could actually see the worlds taking shape, and how it became difficult to hold on to those visions with so many other things to think about. While Julia, the narrator, comes across as perhaps too maturely introspective at times, overall, Julia's gradual awakening is authentic and wonderfully written. It really took me back to that time in my own life, particularly the awkward disconnect between one's thoughts and one's ability to speak/act around boys of interest! I also appreciated that the story's climax was dramatic without being implausible. Another whole topic is Julia's mom's deployment, and Julia's sessions with a counselor and the only other military kid in school (Peter). Baskin's treatment of the absence of a military parent was heart-wrenching, simply and carefully drawn through Julia's memories of moments with her parents before and during the deployment, and her interactions with Peter. PERSONAL RESPONSE: I thought, The Summer Before Boys, was a sweet, young love story. I wasn't too impressed with the book. I thought it was kind of boring at times. I could relate to the main character, Julia, though. In comparison to Julia, I didn't understand why I developed feelings for a boy, and how that could affect an important friendship. PLOT: Julia and Eliza were best friends. They spent their whole lives together, all 12 years to be exact. One summer, Julia spent the whole summer at Eliza's house. Julia's mom was stationed in Iraq because she was apart of the National Guard. Her dad worked often too. Julia and Eliza spent their weekdays together at Mohawk Resort, a hotel Eliza's dad worked at. They swam in the glacier lake, watched movies, and played pretend a lot. Hanging out with Eliza was Julia's escape from worrying about her mother in Iraq. Aside from being worried a lot, Julia had her eye on a boy named Michael. Eliza didn't understand why Julia liked him, so she felt betrayed. Their friendship was put to the test for the first time because of boys getting between them. They had to learn how to overcome their problems and become best friends like the old times again. RECOMMENDATION: I recommend this book to any girl ages 9-12. I recommend this book, because I feel girls get their first crush at that age. It is also a book that 9-12 year old girls could comprehend quite easily. I thought this story was very nostalgic, but it may be hard for a child to follow. There are a few different story lines. It often switches from what the girls are pretending to what is currently happening without warning. A lot of the references would have no meaning to a child today (cabbage patch dolls, beanie babies, etc). This story is about Julia and Eliza, best friends and also family. Julia is technically Eliza’s niece, but they are the same age so they call each other cousins. Julie is I thought this story was very nostalgic, but it may be hard for a child to follow. There are a few different story lines. It often switches from what the girls are pretending to what is currently happening without warning. A lot of the references would have no meaning to a child today (cabbage patch dolls, beanie babies, etc). This story is about Julia and Eliza, best friends and also family. Julia is technically Eliza’s niece, but they are the same age so they call each other cousins. Julie is staying with Eliza’s family at Mohawk Mountain Lodge for the summer while her mother is away for training with The National Guard. The two girls enjoy pretending they were living in the olden days, letting their imaginations run wild- until Michael comes into the picture. Suddenly Julia’s priorities change, along with her relationship with Eliza. After a scary incident when Eliza almost went missing, Julia realized she had taken their friendship for granted. She is told that boys will come and go. By the end of the novel, she realizes how lucky she is to have her best friend and her mother during a time in her life when she’s forgetting who she used to be, but not sure of who she will become. Eliza still likes to pretend, just the way she and Julia have done all their lives. But Julia finds it harder and harder to enter that make-believe world. There are too many distractions in the real world. Some are terrible, like worrying about whether or not her mother will survive her tour of duty in Iraq. Others are much more pleasant, like a certain very cute boy named Michael. Where do your loyalties lie when you find yourself changing, pulling away from a best friend who is so much more than just a friend? 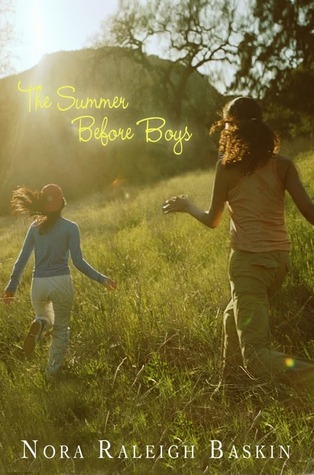 The Summer before boys by Nora Baskin is about a young girl named Julia. This year she is spending her whole summer with her best friend Eliza, while her mother is serving in the National Guard. Julia has always hung out with Eliza, but this year it was different because they had many more privileges. They took many journeys with each other including the one time she met Michael; which ended up being her first real crush. Throughout the summer Julia becomes more interested on what Michael is doi The Summer before boys by Nora Baskin is about a young girl named Julia. This year she is spending her whole summer with her best friend Eliza, while her mother is serving in the National Guard. Julia has always hung out with Eliza, but this year it was different because they had many more privileges. They took many journeys with each other including the one time she met Michael; which ended up being her first real crush. Throughout the summer Julia becomes more interested on what Michael is doing then Eliza which ends up putting their friendship in danger. This book taught me to never let a boy get in the way of anything. No matter how much you may like your middle school crush you will have so many more opportunities with people in the future. Plus, no boy is ever worth having your relationship with your best friend destroyed. Overall, I gave this book 2 out of 5. This book did not interest me at all. The author never threw in any twists throughout the whole book and kept to the same dull story the whole time. Julia and Eliza have been best friends for forever. Oddly enough, they are also aunt and niece even though they are the same age. When Julia's mom is sent to serve in Iraq, she goes to live with Eliza for the summer. Both girls are really excited about this prospect as they always have fun playing imagination games together and just hanging out. But Julia's worry about her mom and the girls changing interests make this summer very different for them. I really didn't think the games they played se Julia and Eliza have been best friends for forever. Oddly enough, they are also aunt and niece even though they are the same age. When Julia's mom is sent to serve in Iraq, she goes to live with Eliza for the summer. Both girls are really excited about this prospect as they always have fun playing imagination games together and just hanging out. But Julia's worry about her mom and the girls changing interests make this summer very different for them. The Summer before boys captures perfectly the awkwardness and transition of age 12 to 13. It had a real childlike quality to it, and I really enjoyed reading it. It's short, and I'm not sure if it's classified as MG or not, but it's very clean. It does have some darker (not extremely dark, but...) issues. It's the first book I've read where a mom is in Iraq. She's dealing with this in the whole book, and I think that it's a noble and needed thing to talk about in contemps. (maybe dark isn't ri The Summer before boys captures perfectly the awkwardness and transition of age 12 to 13. It had a real childlike quality to it, and I really enjoyed reading it. I love the complicated family structure, it really adds to the authenticity, because in real life, families are almost always complicated in some way or another. The friendship between Julia and Eliza is dynamic, and I like to see what causes it to change and grow in different ways. It was a neat touch how they had their imaginary world and it was a form of bonding that helped them. With all my heart, I wanted to give this book 5 stars. I'm not particularly sure why I didn't fall completely in love with this story, but I didn't. I liked it a a lot, but I didn't love it. One thing I did like and hate, was the fact that this was written from the perspective of the boy-crazy and faster maturing girl. Usually these kinds of stories are written from the girl who is lagging behind. Yet, I think this is also why I didn't fall completely in love with it-- I was always the friend of With all my heart, I wanted to give this book 5 stars. I'm not particularly sure why I didn't fall completely in love with this story, but I didn't. I liked it a a lot, but I didn't love it. Yet, I think this is also why I didn't fall completely in love with it-- I was always the friend of the boy crazy girls, so I didn't really feel too bad for Julia. I really appreciate that Nora Raleigh Baskin put in facts about the war and brought up issues of kids with parents serving in the army. I thought that the book The Summer Before Boys was a really good book. I liked the parts when you could not put the book down because you wanted to keep reading. For example when they could not find Eliza and they all went out looking for her to see where she was. I also like the parts when they were talking about her mom and that she missed her and wanted her to come home. Overall I thought this book was well written and had a lot of details. Author Baskin totally nailed the crux of childhood/adolescence. The crazy time when it just clicks on at 12 or 13 and you do want to see the cute boy who caught your eye on the bus, and you don't care if that means you dump your best friend in the world to meet him. She sets this in a wonderful summer hotel world that has it's own amazing appeal and adds tension with a mom serving in Iraq. A terrific book for 6th/7th grade girls. FOR THE REST READ IT! It is really good! i think this book is really awesome. it can tell us what could happen to most friendships. trust me i have seen it before. i would want to read it for ever but i do always want to read new books too. Julia is very scared of her mother being in the National Guard but on the other hand she wants to have her first kiss this summer with a boy she Just met his name is Micheal , but the downside is that Eliza and Julia would have to separate and Julia is considering doing that to Eliza Julia has mixed feeling does she want to leave Eliza or does she want to have her first kiss. Eliza would also have her first kiss to but she does not want to risk losing her best friend/ family member so she might not go through with it but she is mad that Julia is considering leaving her , Eliza is very quiet and keeps things to herself but in some situation she will be outstanding and confront someone for their good or bad actions. Is that Julia is struggling with her mom being in the National Guard but really tries to be strong will she break Character or stay strong.... Eliza is struggling with Julia's decision to leave her and herself's decision to leave Julia or she could not leave Julia and make a strong impact on Julia to change her mind about leaving or having her first kiss to early and with a boy she just met too. Julia's mom is in the National Guard and Julia does not know how to cope with her mom leaving and potentially get hurt but Julia tries to stay strong and not think about bad things that could happen to her mom. 1. Julia tries to get into situations that are not the best just to try to get her mom off of her mind. 2. Eliza does not know what to do or how to help Julia cope with her mom so she tries her best not to let Julia get into the bad situations that she gets herself into in the first place . 3. Julia is really considering leaving Eliza just for a boy because she thinks it's the best options for her but Eliza tries to help the best she can and give Julia all of the support she needs to cope with her mom being gone. My personal opinion on this book is it really brought out my happy and mad emotions because Julia does not know how to cope with her mom being gone she wants to do some not so good things like leave her best friend/ family just for a boy and i love how Eliza tries her very best to help Julia overcome this problem in her life. For a short book, it really had an important message to it. It follows the trail of two life long best friends during the summer. Julia's mom is deployed in Iraq and she's waiting for her mom to come home. Julia is spending the summer with Eliza (best friend). It goes from two different time points basically, since its written from Julia's point of view. I really love the message this book coveys, which is, best friends are forever and everything will be okay. If any children's parents are deplo For a short book, it really had an important message to it. I really, really liked Anything But Typical, so I expected to like this book, but I didn't as much. It just . . . hurt to read. So much discomfort, so much expectation, so much waiting for the inevitable bad thing to happen and so little recovery from it. I think it was well written, though, and I've bumped its rating up to three stars because I think it's quality, even though I personally didn't particularly enjoy reading it. At least it has a happy ending! "But I was changing. Looking back, that day, what was real and what was not real was slowly starting to separate." This is a really great coming of age story, especially for girls. I like how the story goes in and out of pretend and real life because I think that is how 12 year old girls tend to be with one another. Plus, this story is FULL of figurative language including similes, metaphors, and personification! I find this a bit boring.. but girls, if your a teen like me who likes more teeny characters (instead of a girl who is 12 and acts like a 8 year old)..get a different book ( keep reading ), I'm sorry to say this but I think this is required for girls 10 and below. I was disappointed, if you know what I mean. I am seriously an open book. I've been writing semi-autiobiographical fiction since I was in 6th grade (1972) then, in 2001, Little, Brown published my first middle grade novel, about my life in 6th grade! titled "What Every Girl (except me) Knows." Sixteen years and thirteen books later, that still, pretty much sums things up.